This episode of the “About To Review”/ “About To Interview” podcast was thought to be lost forever due to a corrupted memory card, but it has been resurrected! 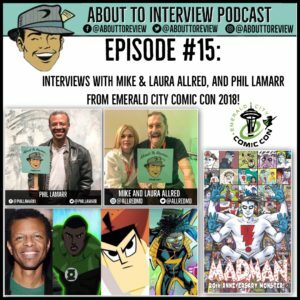 I had the opportunity to interview Mike and Laura Allred, and returning guest Phil LaMarr at “Emerald City Comic Con” here in Seattle on March 1st – 4th, 2018. Mike Allred is an artist, writer, and creator of “Madman”, “iZombie” and Laura Allred is also an artist and colorist known for “Madman”, “X-Statix”, “iZombie”. Phil LaMarr is an actor, comedian, and voice acting legend. Thank you so much to all of the guests who made time to be on this episode, it meant a lot to me especially with how crazy everything was!